Anantara Phuket Villas is a waterfront property located on a stretch of Mai Khao Beach on the secluded northern coast of the island of Phuket. It is a 15-minute drive from Phuket's International Airport (HKT). 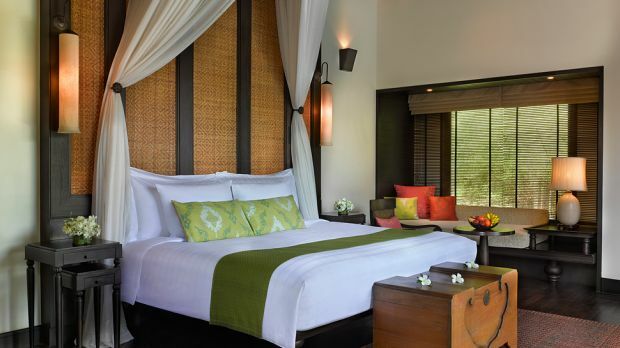 At Anantara Phuket Villas, the senses abound as the best of Thailand is at your beck and call. From the spicy sweet culinary delight that is fresh and seasonal Thai food served up daily by expert chefs, to the calming cool waters of a private pool that shimmers in the moonlight. For the true Thai experience, try poolside yoga under a hazy early morning sun followed by a soothing massage in an open-air treatment room amidst the fresh and luxurious scent of jasmine - the faint sound of the ocean rolling in the distance. Or how about an elephant trek through the jungle region of Phuket? That's right, just you and a guide, exploring the waterfalls and lush flowers of this tropical island paradise atop the beloved Thai elephant, a symbol for the nation itself, and one of the greatest animals ever to walk this earth. Send an availability request with your requested dates to the Anantara Mai Khao Phuket Villas.